What happens when you have giant robots? You need some giant monsters to go along with it. In the case of Pacific Rim Uprising and the latest Godzilla anime it was time to do some team-up work between the two series. While this isn’t exactly the team-up that director Steven S. DeKnight wanted it is still a very cool image found on Anime News Network. 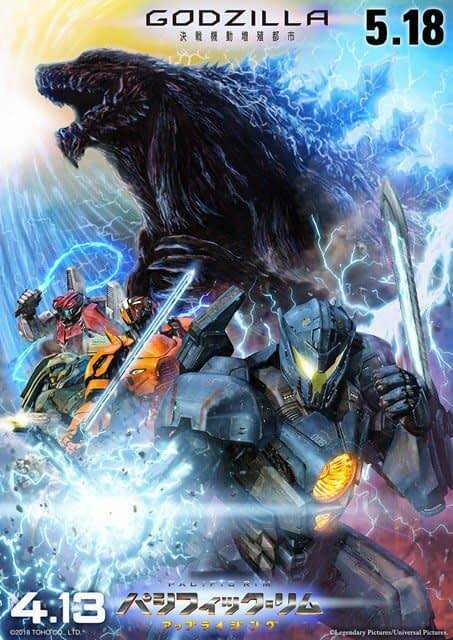 Godzilla: Kessen Kidō Zōshoku Toshi (Godzilla: City on the Edge of Battle), the second film in the Godzilla anime film trilogy, and the Pacific Rim Uprising film are collaborating to promote both their spring releases in Japan. Illustrator Hidetaka Tenjin (mechanical art for Macross Frontier, Aquarion Evol) drew a collaboration visual for both films. The image was originally found on Animate Times in Japanese. The translation is a little rough but Tenji talks about what a “series responsibility” this was because of how important the giant monster and giant robots are to the “Japanese tradition arts”. Pacific Rim Uprising, directed by Steven S. DeKnight, stars John Boyega, Tian Jing, Scott Eastwood, Adria Arjona, Charlie Day, and Burn Gorman. It’s out now.